Geauga County is home to lush forests, picturesque lakes, rolling hills, charming parks, town squares, eclectic family businesses, and plenty of other treasured haunts. 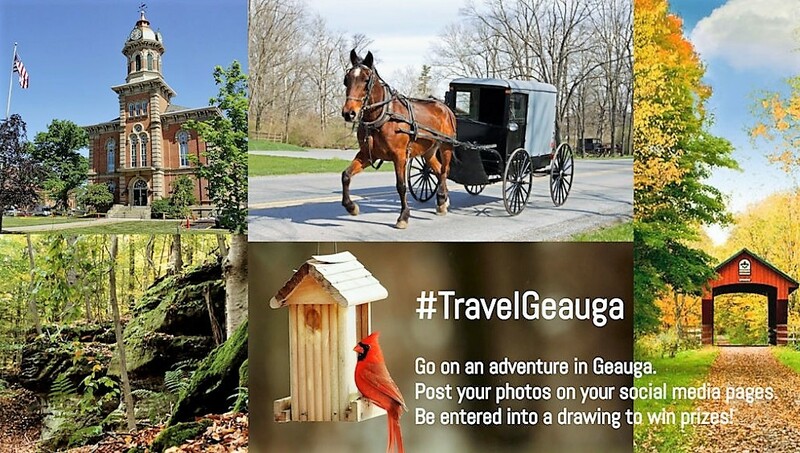 To help people discover the attractions right here in their backyard, Geauga County Public Library (GCPL) is sponsoring a #TravelGeauga social media adventure all May with Burton Public Library. This springtime staycation opportunity gives participants a chance to win local travel and recreation prizes while sharing photos of themselves at nine Geauga destinations. How it works: Each Wednesday beginning May 1st, GCPL will provide clues on Facebook, Twitter and Instagram to two or three different destinations in Geauga County. To participate, people need to crack the clue, visit the destination, snap a photo of themselves (selfies are fine) with some distinguishing characteristic of the site, post to their social media using hashtag #TravelGeauga, and tag @GeaugaLibrary. That’s it! Winners will be notified on social media sites Monday, June 3rd. Each photo on social media that’s tagged correctly (using #TravelGeauga, @GeaugaLibrary) will earn the poster an entry. Participants can visit as many destinations as they’d like at any time throughout the month. If someone posts a photo to all three social media sites (Facebook, Instagram, and Twitter) during any given week for one clue, he or she would have three chances to win on that particular clue. If people visit all nine destinations and upload a photo of themselves to all three social media sites, they could be entered 27 times. The more you post, the more opportunities you have to win. This #TravelGeauga adventure ends at 11:59 p.m., Thurs., May 30th, at which time no more entries will be accepted. All clues, their corresponding locations, and the prizewinners will be announced on all social media sites by 5:00 p.m., Monday, June 3rd, 2019. Winners must state at which library location they will pick up their prizes, and have one week to claim them. The fine print: Each location’s Friends and / or Foundation donated a prize. Odds of winning depend upon the number of people who submit photos and tag them correctly. Winners have one week to claim their prizes, after which time prizes will be re-purposed. GCPL determines which prizes accompany which clues / destinations. The #TravelGeauga adventure is not sponsored, administrated, or endorsed by Facebook, Twitter, or Instagram. Void where prohibited. The Geauga County Public Library includes four full-service branches in Bainbridge, Chardon, Chesterland (Geauga West) and Middlefield, two library stations housed in schools in Newbury and Thompson, and a Mobile Services fleet that serves rural areas and community centers. Its administrative center is located in Chardon, where technical services, computer services, facilities and administrative functions reside. GCPL houses more than 750,000 books and digital books. The collection also contains more than 100,000 audio / video items. About 75 research databases are available via its website. GCPL is a member of the Clevnet consortium, giving patrons access to more than 12 million items. Learn more about the Geauga County Public Library at the GCPL website, Geauga County Public Library. Pictured In Cover Photo: Crack #TravelGeauga clues all May on GCPL’s and Burton Public Library’s social media sites. Then, visit the destinations, snap a photo of yourself there, and tag @GeaugaLibrary with #TravelGeauga on Facebook, Twitter, and / or Instagram to be entered into a drawing for prizes.